Soil-transmitted helminth (STH) infections are responsible for a huge public health burden, however treatment options are limited. 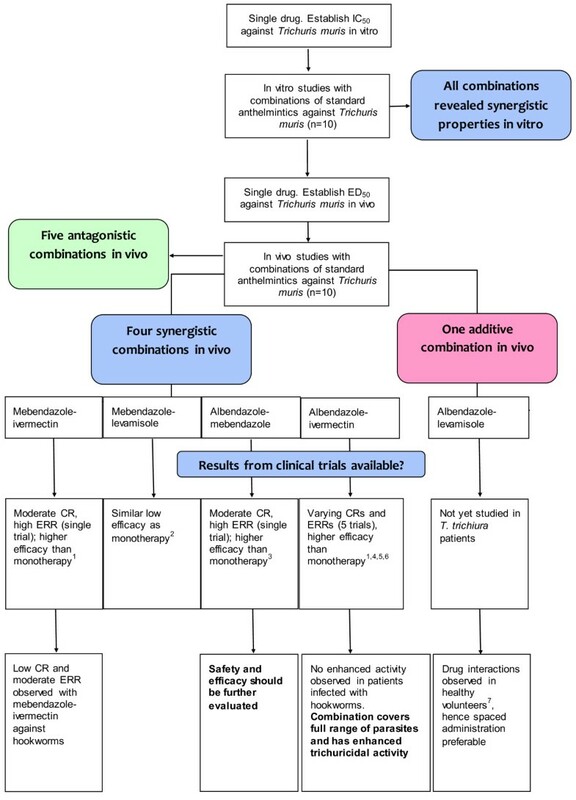 The discovery and development of novel efficacious drugs or drug combinations for the treatment of STH infections therefore has a high research priority. We studied drug combination effects using the main standard anthelmintics, albendazole, mebendazole, levamisole, pyrantel pamoate and ivermectin in the Trichuris muris model. Drug combinations were first tested in vitro and additive and synergistic combinations investigated further in vivo in female mice using ratios based on the ED50 of the respective drugs. In vitro all 10 combinations of the standard anthelmintics tested against T. muris revealed synergistic behavior. We identified three drug combinations in vivo as strongly synergistic, namely mebendazole-ivermectin (Combination index (CI)=0.16), mebendazole-levamisole (CI=0.17) and albendazole-mebendazole (CI=0.23). For albendazole-ivermectin, moderate synergism was observed (CI=0.81) and for albendazole-levamisole a nearly additive effect was documented (CI=0.93) in vivo. Five combinations (albendazole-pyrantel pamoate, mebendazole-pyrantel pamoate, levamisole-pyrantel pamoate, levamisole-ivermectin and pyrantel pamoate-ivermectin) were antagonistic in vivo. Our results strengthen the evidence that combination chemotherapy might play a role in the treatment of Trichuris infections. Albendazole-mebendazole should be studied in greater detail in preclinical studies. Soil-transmitted helminth (STH) infections impose a major public health burden mostly among poor populations. It has been estimated that in 2010, 5.3 billion people, of these 1.0 billion school-aged children, were at risk of infection with at least one STH species. Preventive chemotherapy, with the two benzimidazoles, albendazole and mebendazole forms the bedrock of helminth control initiatives preventing morbidity due to helminthiases. However, the number of drugs used to treat infections with STH are limited, have only a low efficacy against Trichuris trichiura as a single dose treatment and there is a potential for the development of drug resistance[3, 4]. Therefore, recently the Disease Reference Group on Helminth Infections established by the Special Programme for Research and Training in Tropical Diseases (TDR) was given the mandate to develop a research and development agenda for intervention tools considered necessary for control and elimination of human helminthiases. The discovery and development of novel efficacious drugs was identified as one of the top research priorities. In addition, it has been emphasized that more research should be undertaken to investigate whether combinations of different anthelmintics would reveal synergistic effects and would therefore improve control of helminth infections. Indeed, to date, limited research has been done to assess whether combinations of different anthelmintics produce synergistic effects. We have recently studied the effects of oxantel pamoate in combination with standard drugs albendazole, mebendazole, pyrantel pamoate, levamisole and ivermectin against T. muris in vitro and in vivo (Keiser et al., submitted for publication). Using Caenorhabditis elegans, significant synergy was documented between Cry proteins from Bacillus thuringiensis and tribendimidine or levamisole. Similarly, tribendimidine combined with levamisole showed synergistic effects against Ancylostoma ceylanicum in vitro and in vivo in male Syrian Golden hamsters. Several clinical trials have also been conducted with drug combinations in patients infected with hookworms or T. trichiura[4, 9–11], however, the scientific basis for selecting these combinations is not clear. Prior to clinical trials, drug combination studies in vitro and/or in animal models followed by preclinical drug interaction studies should be carried out to determine the basis and rationale for studies in humans and to confirm that concomitant use of the medications is safe. The aim of the present study was to analyze drug combination effects using the main standard anthelmintics albendazole, mebendazole, levamisole, pyrantel pamoate and ivermectin in the T. muris mouse model. Drug combinations were first tested in vitro and additive and synergistic combinations further investigated in vivo. Albendazole and levamisole were purchased from Fluka (Buchs, Switzerland). Mebendazole, ivermectin and pyrantel pamoate were acquired from Sigma-Aldrich (Buchs, Switzerland). Drug stock solutions of 10 mg/ml were prepared in 100% DMSO (Sigma-Aldrich, Buchs, Switzerland) for in vitro studies. These were stored at 4°C pending use. For in vivo treatments, the drugs were suspended in 10% Tween 80 [70% EtOH (70:30 v/v)] (Buchs, Switzerland) and 90% deionised H2O just prior to oral administration. Experiments were performed in accordance with the 3R rules for animal experiments. The current study was approved by the cantonal veterinary office Basel-Stadt (Switzerland) based on Swiss cantonal and national regulations (permission no. 2070). Four week-old female C57BL/10 mice were purchased from Harlan (Blackthorn, UK). Before infection, animals were acclimatized for one week in the animal facility. Groups of 10 mice were kept in macrolon cages with ad libitum access to water and rodent food (Rodent Blox from Eberle NAFAG, Gossau, Switzerland). The T. muris life-cycle and maintenance have been described elsewhere[12, 13]. Briefly, mice were treated with 1 mg/l dexamethasone (dexamethasone-water soluble, Sigma-Aldrich) supplied in the drinking water 2 days before infection by oral gavage with 200 embryonated T. muris eggs until 2 days preceding treatment. Adult worms were recovered from the intestines of sacrificed animals from day 35 p.i. onwards (binocular, magnification 16x) and kept at 37°C, 5% CO2, in RPMI medium [10.44 g RPMI 1640 (Gibco, Basel, Switzerland) 5 g albumax H (Gibco), 5.94 g HEPES (Sigma-Aldrich) and 2.1 g sodium bicarbonate (Sigma-Aldrich) in 1 l dH2O] supplemented with 5% v/v amphotericin B (stock: 250 μg/ml, Sigma-Aldrich) and 1% v/v penicillin-streptomycin (stock: 10,000 U/ml penicillin + 10 mg/ml streptomycin, Sigma-Aldrich). Two adult worms were incubated in each well of a 48-well plate containing 500 μl pre-warmed supplemented RPMI medium (described above), and 500 μl drug solution. IC50 (50% inhibitory concentration) values of the standard drugs were determined in our laboratory prior to this work and are summarized in Table 1. In more detail, for levamisole and pyrantel pamoate, IC50s of 16.5 and 34.1 μg/ml were reported. If no activity of the drugs on the worms was observed at the highest concentration tested as for albendazole, mebendazole and ivermectin, IC50 values of 200 μg/ml were chosen arbitrarily for the drug combination studies presented here. Six concentrations of each drug concentration were tested, starting with the IC50 value of each partner drug (IC50+IC50), which was two-fold diluted up to a final concentration of 1/32IC50+1/32IC50. Control worms were incubated in medium with equivalent DMSO concentrations (maximum 4% v/v). The plate was incubated at 37°C and 5% CO2. After 72 h the motility was evaluated under a light microscope (magnification 20-80x) using a motility scale from 0 to 3 (0 = dead, 1 = very low motility, 2 = low motility, 3 = normal motility) as described previously. Experiments were carried out in duplicate and repeated at least twice. Data obtained from the individual experiments were averaged and adjusted to the values obtained from untreated controls. The nature of each drug combination was characterized by a combination index (CI) as described by Chou and calculated with CompuSyn (CompuSyn, version 3.0.1, ComboSyn, Inc., Paramus, NJ 2007). We used the following classification CI<0.1 very strong synergism, CI: 0.1-0.3 strong synergism, CI: 0.3-0.7 synergism, CI: 0.7-0.85 moderate synergism, CI: 0.85-0.9 slight synergism, CI: 0.9-1.1 nearly additive and CI>1.1 antagonism. Synergistic and additive drug combinations identified in vitro (CI≤1) were tested in infected animals using a constant dose ratio as described below. IC50 median inhibitory concentration. r = linear correlation coefficient of the median-effect plot, indicating the goodness of fit. r ≥ 0.85 indicates a satisfactory fit. § IC50s of albendazole, levamisole, and pyrantel pamoate have been published elsewhere. On day 40 post-infection the presence of a chronic T. muris infection was confirmed in each mouse by an egg positive stool examination. Groups of 4 mice were assigned to treatment or served as untreated control. ED50s (median effective doses) of each standard drug had been determined in our laboratory prior to this work and were as follows; 345 mg/kg for albendazole, 79 mg/kg for mebendazole (Keiser et al., submitted for publication), 46 mg/kg for levamisole and 4 mg/kg for ivermectin. An arbitrary value of 300 mg/kg was chosen for pyrantel pamoate, for which no ED50 could be calculated. The ratio of the ED50s of each partner drug was chosen as starting dose (drug 1 ED50+ drug 2 ED50). If a combination treatment decreased the worm burden by at least 75% (threshold for additivity when the dose effect curves for both drugs are hyperbolic), the drug doses were reduced by half. Stools were collected for up to 72 h post-treatment and the expelled worms were counted. Mice were killed one week post-treatment by exposure to CO2, the entire intestine was dissected and all remaining worms counted. Drug activity was expressed by worm burden reduction (WBR) and worm expulsion rate (WER) as described elsewhere. The significance of the WBR was tested using the Kruskal-Wallis test (several treatment doses vs. controls) or the Mann–Whitney U-test (one treatment dose vs. control) using StatsDirect (version 2.4.5; StatsDirect Ltd; Cheshire, UK). Combination indices (CI) were calculated with CompuSyn as described above. All 10 combinations of the standard anthelmintics tested against T. muris in vitro resulted in a synergistic interaction (Table 1). A very strong synergism (CI<0.1) was observed for albendazole-mebendazole, albendazole-ivermectin and mebendazole-ivermectin (all CIs<0.001), mebendazole-levamisole (CI=0.04) and levamisole-pyrantel pamoate (CI=0.007). For the other 5 combinations (albendazole-levamisole, albendazole-pyrantel pamoate, mebendazole-pyrantel pamoate, levamisole-ivermectin and pyrantel pamoate-ivermectin a strong synergism (CI=0.11-0.14) was determined. Since all anthelmintic drug combinations yielded synergistic effects in vitro, they were further investigated in vivo using the ED50 of each drug (drug 1 ED50 + drug 2 ED50) as starting dose. The results are summarized in Table 2. We identified three drug combinations as strongly synergistic, namely mebendazole-ivermectin (CI=0.16), mebendazole-levamisole (CI=0.17) and albendazole-mebendazole (CI=0.23). These drug combinations still achieved significant WBRs when drug dosages of 1/16 ED50 were combined. For example, a WBR of 70.3% was achieved, when 4.9 mg/kg mebendazole was combined with 0.25 mg/kg ivermectin. Note that mebendazole plus ivermectin (at the highest dose) was the only combination that resulted in complete elimination of worms. Numbers in superscript refer to the corresponding control group. aP-values were obtained from the Kruskal-Wallis test (several treatment doses vs. controls), bP-values were obtained from the Mann–Whitney U test (one treatment dose vs. controls). The CI at ED50 are based on worm burden reductions. N.D. = not determined. ABZ: albendazole; MBZ: mebendazole; LEV: levamisole; PYR: pyrantel pamoate; IVM: ivermectin. For albendazole plus ivermectin a moderate synergism was observed (CI=0.81) and when albendazole was administered together with levamisole a nearly additive effect was documented (CI=0.93). Five combinations (albendazole-pyrantel pamoate, mebendazole-pyrantel pamoate, levamisole-pyrantel pamoate, levamisole-ivermectin and pyrantel pamoate-ivermectin) revealed an antagonistic behavior. Four of these drug combinations (mebendazole-pyrantel pamoate, levamisole-pyrantel pamoate, levamisole-ivermectin and pyrantel pamoate-ivermectin) showed an effect at the highest dosage tested (ED50+ED50) with WBRs of 79.7-96.8% but only low activity when half of these dosages were used. Albendazole-pyrantel pamoate (ED50+ED50) resulted in only a moderate worm burden reduction of 44.2%. The treatment of T. trichiura infections in humans has significant deficiencies, since none of the available anthelmintics achieves high cure rates and egg reduction rates, when the drugs are administered as single doses in the framework of preventive chemotherapy treatment campaigns[2, 3]. Combination chemotherapy is common medical practice in several medical fields such as cancer, bacterial infections, HIV or malaria[4, 16, 17] as well as in veterinary medicine since an efficacious intervention often requires the combined action of two or more interacting therapeutic components. Furthermore, avoiding drug resistance has been a major rationale for combination chemotherapy from the start[16, 17]. To the best of our knowledge, we have for the first time thoroughly evaluated the activity of combinations of available marketed human anthelmintics against the laboratory model T. muris in vitro and in vivo. In vitro, all combinations were found to be synergistic (Figure 1) and therefore followed up in vivo. Four drug combinations were identified in vivo using drug doses based on ED50 values, which showed synergistic properties namely mebendazole-ivermectin, mebendazole-levamisole, albendazole-mebendazole and albendazole plus ivermectin. In addition, for the combination of albendazole and levamisole an additive trichuricidal effect was documented (Figure 1). A good correlation between the in vitro and in vivo results was observed with the 3 drug combinations showing a strongly synergistic effect in vitro (albendazole-mebendazole, albendazole-ivermectin and mebendazole-ivermectin) also revealing synergism in vivo. It is interesting to note that the synergistic combinations identified comprise at least one benzimidazole. Drug combinations containing pyrantel pamoate as well as levamisole combined with ivermectin were found to be antagonistic. An increased bioavailability of ivermectin was observed when the drug was given concurrently with levamisole in healthy volunteers, however, it is not clear whether this pharmacokinetic interaction has an influence on the activity against T. muris in mice. Unfortunately, possible mechanisms underlying synergistic or antagonistic effects are presently not available for any of these anthelmintic drug combinations. It has recently been suggested that an increased efficacy of an albendazole-mebendazole combination over albendazole or mebendazole monotherapy might be explained by an extended contact period of the worms with the active compounds (active compounds present successively: mebendazole first followed by the main metabolite of albendazole, albendazole sulfoxide). However, it has been suggested that the parent drug albendazole, more lipophilic, exerts the main anthelmintic action as the transcuticular diffusion is thought to be more important for drug uptake by worms[20, 21], which would contradict the above mentioned hypothesis of an increased activity due to albendazole sulfoxide. Study flow diagram, illustrating the results of our studies and placing them in context with clinical trials.1: Reference, 2 Reference, 3 Reference, 4 Reference, 5 Reference, 6 Reference, 7 Reference. ERR: egg reduction rate; CR: cure rate. Clinical trials have been conducted with the four synergistic combinations reported here (Figure 1). Ironically these trials have been conducted without any preclinical supporting information, either on efficacy or potential toxicity. No enhanced trichuricidal efficacy was observed when a combination of mebendazole and levamisole was given to school-aged children on Pemba island. However, our findings of the synergistic effect of albendazole-ivermectin, mebendazole-ivermectin and albendazole-mebendazole in T. muris-infected mice are in line with results from patients infected with T. trichiura. Briefly, five studies investigated the efficacy of albendazole-ivermectin[10, 23–26] and increased cure rates and egg reduction rates for the combination compared to albendazole or ivermectin were observed in all trials. Clearly, a tremendous advantage of an albendazole-ivermectin combination is its broad spectrum of activity targeting not only the soil-transmitted helminths, including Strongyloides stercoralis but also lymphatic filariasis and onchocerciasis. In three of the trials the effect of albendazole-ivermectin was also assessed against infections with hookworms, however, no increased therapeutic benefit was observed for albendazole-ivermectin over albendazole[10, 22, 24]. Moreover, the combination has already been studied in onchocerciasis patients and no pharmacokinetic interactions were observed. Mebendazole-ivermectin showed an even superior activity to albendazole-ivermectin, which might be explained by the higher sensitivity of Trichuris spp. to mebendazole than albendazole. However, it is important to mention that the combination of mebendazole and ivermectin only achieved moderate egg reduction rates and low cure rates against hookworm infections. Finally, albendazole-mebendazole achieved a higher cure rate (46.1%) compared to albendazole (6.0%) and mebendazole (11%) in school-aged children infected with T. trichiura in Uganda. In the present work an additive effect was observed when levamisole was administered in combination with albendazole to T. muris-infected mice. To our knowledge, this combination has not been used in the treatment of trichuriasis. However, Awadzi and colleagues have shown that clinically significant drug interactions occur between the two drugs, resulting in a reduction of albendazole sulfoxide and levamisole plasma levels as well as unexpected adverse events in onchocerciasis patients. Hence, given these pharmacokinetic interactions a simultaneous co-administration of albendazole and levamisole cannot be recommended. We have identified four synergistic and one additive combination against T. muris in the mouse model. To shed light on the next steps to be undertaken we have placed our findings in context with Phase I and Phase II clinical trials conducted with these drug combinations in previous years. In addition, it has to be emphasized that the four species of nematodes (Ascaris lumbricoides, T. trichiura and both hookworm species, Ancylostoma duodenale and Necator americanus) are treated collectively in preventive chemotherapy programs and the treatments should therefore have high activities against all these species. Albendazole-mebendazole has emerged as an interesting and unexpected drug combination, hence this treatment should be studied in greater detail including drug interaction studies as well as studies against hookworms. In addition, albendazole-ivermectin offers the advantage that it is well studied, has increased trichuricidal activity over albendazole and ivermectin alone and has a broad spectrum of activity. We are grateful to SNSF (project no. PPOOA3-114941 and PPOOP3_135170 to JK) and the Medicor Foundation for financial support. JK and LT designed the studies. MV and RA carried out the experiments. JK and LT wrote the manuscript. All authors read and approved the final version of the manuscript.